More and more we are becoming aware how the choices we make every day are what contribute to our health and wellbeing. Our choices on a day to day basis are cumulative so if we consistently choose the healthy food option, or regular exercise, over time we become healthier. The reverse is also true; regular bad food choices lead to a body that is depleted in essential nutrients and over time will not be able to repair and heal the way we expect our bodies to be able to. So here are some areas that can make a huge difference over time with a little attention every day. 1. Practice a Positive Mind-set. We often have automatic negative thoughts that invade our thinking – notice these thoughts and replace them with something positive. A moment of gratitude works well! 2. Refreshing Sleep. This is an area that needs more and more attention in our busy, overloaded lives. Sleep is essential for our body’s repair and healing processes. Go to bed at the same time and wake at the same time every day. Reduce any expose to screens and blue light for an hour before you are going to sleep. Make the room as dark as possible. 3. Move Your Body. We are all familiar with how important exercise is so make it a priority to get some exercise every day. Do your spinal hygiene exercises. Standing, bend forward and touch your toes, then come up and bend backwards arching your spine, then come upright and bend sideways in each direction and then rotate looking over each shoulder. Do the same movements with just your head to loosen up your neck. ​4. Posture – Sit Up Straight. We sit too much and this is causing as many health issues as smoking does. Simply taking your spine into extension – lift your arms to shoulder height, look up to the ceiling and lift your breastbone, will help reverse that forward computer posture. Do this at least once every hour that you are sitting. 5. Nourishing Food. Our food provides the nutrients that our bodies need to heal and repair – so put good quality in so that your body will last well into the future. A few simple changes can make the world of difference. Add more vegetables, the wider the variety of colour, taste and texture the better. Drink more good quality water. Avoid additives, preservatives, sugars and processed foods. We hope that these tips will make a difference in your life so that you stay healthy and energised for long into the future! ​We had a very successful talk on Saturday in preparation for doing the 10 Day Metabolic Detox over the next 10 days. I wanted to give a little summary of what we spoke about which might motivate you to join us doing this detox or perhaps give you some inspiration to join us on the next one! We recommend that you do an efficient detox at least twice a year because even though our body is always going through a detoxification process it may not be doing it as efficiently as it could for various reasons like nutrient deficiency, stress or genetic factors. So are you toxic? Do you need to be doing a detox? The question is no longer if you are toxic but rather how toxic we are. The CDC has found that most Americans have over 200 toxins in their blood and urine and I’m sure that here in South Africa we are not far behind. These toxins are all around us in our household cleaning products, our skin care products, the plastics we use, pesticides and other chemicals we spray on our growing food as well as additives we put into our processed food. Genetics, environmental exposure, diet and lifestyle can affect our ability to excrete these toxins which leads to a build-up of toxins in our body, an increase in the toxic burden. This is impacting on our quality of health. The symptoms can be subtle and have probably been building up over months and years. Low energy levels, chronic fatigue, muscle aches and pains or more severe fibromyalgia. Difficulty concentrating or brain fog is common. Noticing that you’re more sensitive to certain foods or odours and perfume. Behavioural changes, irritability and headaches can all indicate a level of toxicity, as can changes in your gastrointestinal function or abdominal pain. So the aim of the detox is to normalise the body’s ability to process and excrete toxins while temporarily reducing the toxins coming in. Detoxification is an energy dependent process that needs calories and nutrition to fuel this process and support the detoxification pathways. The liver is the main detoxification organ which needs vitamins, minerals and amino acids from protein to work properly. Unfortunately juicing and other fasting programmes can actually deprive your body of essential nutrients needed to support detoxification so while these may good to do for other reasons we prefer this method to detox the body. The benefits of a good detox are more energy and less fatigue. Improved memory as the brain fog lifts. Less cravings for coffee and sugar to help you get through the day. Less water retention and even a shift in weight as you reduce your levels of inflammation. Fill out our questionnaire on your level of toxicity. This will give you a baseline of how toxic your system is. Mild toxicity will respond to the 10 day programme but if you have severe levels of toxicity you may want to consider the longer programme. 1. Initial clearing – this is where we eliminate the foods that can be causing toxicity such as processed foods, sugar, red meat, coffee, alcohol. We suggest starting on a Monday so that when you get to the most intense part of the detox it falls over the weekend when you can rest and support the detoxification process. 2. Metabolic detoxification – here we eat only selected foods, reducing all allergenic foods such as dairy and nuts while increasing our nutritional supplements. You can eat as much as you need to of the selected foods, we don’t want you to be hungry. 3. Reintroduction – at the end of the detox we start reintroducing the foods that you have eliminated slowly. Your body is more sensitive and when you put these foods back you may notice a reaction such as bloating, skin changes or changes in your energy levels. This may indicate that your body has always had a sensitivity to these foods and you would benefit in eliminating them for a longer period. • If you are a huge coffee drinker it would be wise to reduce your coffee intake for a week or two before you start your detox programme and increase your hydration by drinking plenty of purified water. • Don’t overscoop your nutritional supplement – it is measured to last the whole programme. • Regular elimination is very important. The toxins have to get out via our bowel and urine so increase your fibre and drink more water. • If you weren’t sure yet – please drink plenty of water, this is a detoxification process and we are encouraging the body to flush these toxins out. • Eat plenty of food from the recommended food list. Don’t get hungry – your body needs nutrients to efficiently metabolise these toxins. Do the questionnaire again at the end of the programme and be amazed at how the symptoms have changed in just 10 days. Again we recommend you do a detox twice a year – so we will see you in September! February has the perfect number of days for a 28 day Plank Challenge !! Doing the plank exercise improves your posture. A good posture boosts your mood, increases your productivity and ensures that you are able to breathe more effectively. The plank engages multiple muscle groups simultaneously. It strengthens your shoulders, hamstrings, glutes and core. Increased stability protects you from other workout injuries meaning less days off from your workout schedule. Weight-bearing exercise lays down new living bone tissue and increases circulation to the joints. Strike a plank pose regularly and you have healthier bone density without any jarring impact which can do harm. Knowing all of that, makes being able to hold a 4 minute plank seem like the best gift February's 28 days could give us. The best part is that you can plank anywhere with no special equipment required. We are definitely up for the challenge. Time to dust your plank poses off the shelf, challenge your friends and family and join us. Share your planking pics on our Facebook page each day for the 28 days. ​​Champagne glass in hand, all excited for the coming year, I prompted a conversation about resolutions. A family member's answer was “ The only successful New Year resolution I've ever made, is not to make any”. This was as the countdown to 2019 began, perhaps a little too last minute to change his mind. 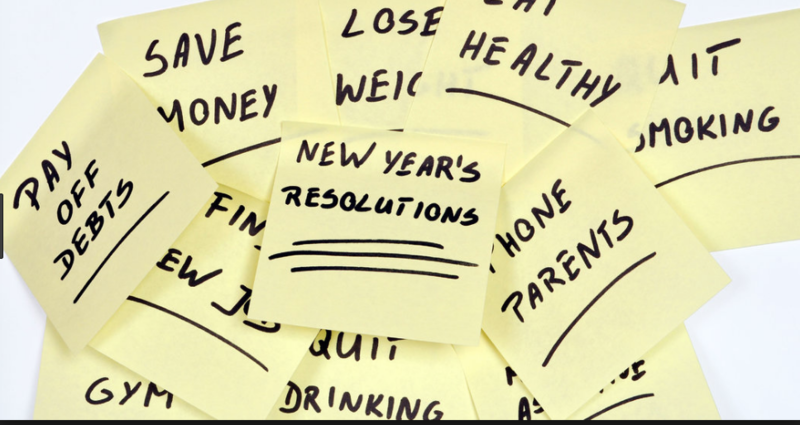 It got me thinking about this tradition and why New Year resolutions are so seldom achieved. So on a new found mission to make my hastily scribbled list a reality, I chatted to more people, I did some reading and I reflected a little on why my previous resolutions haven't stuck. I wanted to share my new found wisdom. 1. Intention is far more important than “musts” and “shoulds” - the immediate tendency with being told to do something, is to rebel even if we told ourselves to. On that note, if your resolution is about meeting someone else's expectation, it does not have your intent behind it and chances are, you will let it go somewhere around February. By making the resolution more about the intention, we create a sense of direction instead of destination, of moving forward instead of arriving. This makes every action towards the intention a success. The key is to believe that you can and replace all negative self talk with positive, kind words. 2. Deprivation and punishment are not motivating. Make the goal more about what you are gaining than what you may feel you will be “giving up”. It is easier to stick to something when you are visualising the reward instead of avoiding the punishment. 3. Dream BIG !! Then break it down into segments to avoid the BIG becoming the overwhelming. Create a plan and check in with yourself on a weekly basis. I am going to repeat, be kind to yourself. Be willing to adjust your environment or circumstances where possible, to alleviate obstacles and know that moving a few of this weeks tasks to next week is not a big deal. Remember the BIG DREAM, don't derail it completely because this week didn't work out the way you'd hoped. Follow your intention and move forward. Celebrate EVERY success. 4. The why is far more valuable than the how. The desire creates personal meaning and even when the how aspects get a little tough, the why remains motivating. If your why is because you should or must, read the first one again and reevaluate whether this resolution deserves to be on your list. When you write down the resolution, write down the reason for it too. Go back to the reason when you feel the resolution coming unstuck. 5. There is a belief that we are “innately perfect and that our job is to come home to that”. Nothing about your resolutions needs to be more perfect, nothing about your actions towards your goals, needs to be more perfect. If you wait for every star to align and every T to be crossed, you will likely never start. If you look at what is missing in everything you achieve, you will probably not continue. Celebrate how perfect you are in your imperfection and enjoy the journey. My original hastily scribbled list now represents a number of ways to leave this year feeling like I have not achieved what I set out to. So, my options were to follow the advice and abandon the concept altogether or take another look and start over. And so, the fireworks and champagne have come and gone and we are fast approaching that awkward time when it is too late into January to be wishing each other Happy New Year and my list of resolutions has yet to be finalised, but I am more positive about the direction I am taking and less inclined to feel that I have complied with an expected tradition. If you had decided to abandon yours, perhaps you will reconsider. Keep them simple, quality over quantity and most of all let each one be meaningful and life enriching for you. Happy 2019. May all your dreams come true ! Dr Susan and myself have been discussing the epidemic of broken brains in our videos that we have posted on our face book site (https://web.facebook.com/pg/fourwayschiro/videos/?ref=page_internal) over the last few weeks. What is a broken brain you might wonder, and do I have one? If you are suffering from irritability, mood swings, or forget where you place your keys, or someone's name, or even something more serious like depression, anxiety, bipolar, ADD or ADHD, dementia, Alzheimer's, Parkinson's or autism to name a few, then you have a broken brain. ​Often though the cause of these symptoms may actually be in the body. The gut and brain are in close communication with one another, and the immune system. The microbiome (all the bacteria) in the gut is responsible for producing about 90% of the neurotransmitters found in the brain. Those feel good ones, like serotonin and dopamine, as well as even acetylcholine (where a lack of this may cause us to forget words for instance) and GABA (where a lack of this would cause anxiety). This microbiome may become damaged through the use of medications and antibiotics, the foods we eat (animal protein with antibiotics) and the water we drink (chlorinated). The gut lining may also become more permeable allowing undigested food particles and other toxins to filter through. Gluten has been shown to do this, in everyone! The immune system does not recognize these foreign particles and initiates an attack, an inflammatory response, which releases cytokines which tell the brain that there is an attack, and so the glial cells in the brain also initiate an inflammatory response. We end up then with an inflamed system, and an inflamed brain, which then leads to the symptoms like brain fog, poor focus and concentration, memory loss, mood disorders and the like. ​Other things that contribute to or cause this are our poor diets, high in sugars, processed foods, damaged vegetable oils and fats, colorants, additives, preservatives, GMO's, toxins (from pesticides, arsenic in the water, plastics) and heavy metals (mercury in fish and fillings, aluminium in foil and vaccines) as well as nutrient deficiencies. Chronic stress, sedentary lifestyles and lack of sleep also cause inflammation, anxiety, and even damages the hippocampus causing memory loss. ​Where in the past it was thought that we were born with a certain number of brain cells and that the brain never made new ones. Once cells were damaged, or if you had a learning difficulty or developed dementia, there wasn't a lot you could do about it and it would just get worse over time. We know now however that this is untrue and that the brain is neuroplastic, that it can rewire itself and even grow new brain cells ! Chiropractic adjustments have been shown to rewire the brain and promote neuroplasticity. Eating a brain healthy diet rich in good fats (coconut oil, avocados, omega 3's), phytonutrients (colourful vegetables), especially broccoli, have been shown to promote neuroplacticity and reduce inflammation too. ​In my next blog I will list 7 basic steps you can do to help you to heal your broken brain and achieve an ultramind. ​Statistics reveal that 80% of the population will experience lower back pain at some point in their life. With such a high statistic, we decided to create a video series of simple exercises that you can perform on a daily basis to help to prevent and manage lower back pain. We created 4 videos, where you would start with video 1, and perform these exercises every day for a week, before progressing onto video 2 and adding those exercises to those from video 1 every day for a week, before progressing onto video 3 and then finally video 4. Please scroll through to the video page and take a look at these videos and perform them daily for a month. ​Research shows that the muscles atrophy rather quickly after any type of injury or insult, but take 3 months of rehab to correct. So once you have done the month, pat yourself on the back! well done! Continue doing all the exercises for another 2 months, even if it is only every second or third day, just try to keep it up. If you feel pain with any of these, please call your chiropractor. We are all exposed to toxins via the water we drink, the foods we eat, the air we breathe, the house hold cleaners we use, the hygiene products we put on our skins. All these toxins inhibit our body's natural ability to heal. The Fourways Chiropractic team have challenged each other to shelve the excuses and put away the doubt. We challenge you to join us on 2 October 2017 our 10 DAY DETOX journey. Please email reception@fourwayschiro.co.za and like and follow us on facebook for further information. Your spine has a very close and important relationship with your nervous system. Your nervous system controls everything in your body. If your nervous system is working free from interference, then your body is working as it should (self-healing and self-regulating). In the Ogura Study in 2011, the authors concluded that spinal adjustments improved mechanical function, inhibited sympathetic nerve system activity (decreased stress hormones), improved heart rate, breathing, ATP, and thinking by increasing blood flow, enhancing brain glucose utilization, and improving all brain function. To find out if you have increased sympathetic tone, or are at risk of certain diseases, or if we can help with any current health concerns, please call us for a stress response evaluation today. I came across this beautiful and accurate analogy today when listening to a talk by Dr Russ Rosen, a wellness chiropractor and coach in Hawaii. According to Roger Sperry, a neuropsychologist, neurobiologist and Nobel laureate who won the 1981 Nobel Prize in Physiology and Medicine, when the spine is moving, it is like a windmill creating electricity. The spine houses the spinal cord, and movements of the spine send messages up to the brain which then send messages down to the rest of the body telling it what to do, giving it life. It is imperative therefore for the spine to moving optimally. We have no idea how important it is for the spine to be moving optimally. If there are any blockages in the spine, affecting the messages to and from the brain, to the organs, the organs that are supplied by those nerves start to show signs of dis-ease within 6 weeks! Within a couple of months the cells start to die. Chiropractors are experts in assessing spinal movements and function and restoring loss of movement and function. And in doing so, are affecting people’s brains and ultimately their lives! The way they see or perceive the world, the way they function, their quality of life, their health, their relationships, their jobs! Wow! Isn’t that amazing?! The number of people living to the age of 100 is growing. The people that have reached the age of 100, when asked if they thought they would, said no. A question then would be, if you knew you were going to live to 100, what would you do differently to look after your body to ensure that you are comfortable and still fit and able at the age of 100? So whether you have symptoms or not, get your spine checked by a chiropractor! Make sure that it is moving optimally to ensure that you can function at your peak, and live your life to the fullest, for the very short time that you have on this earth! 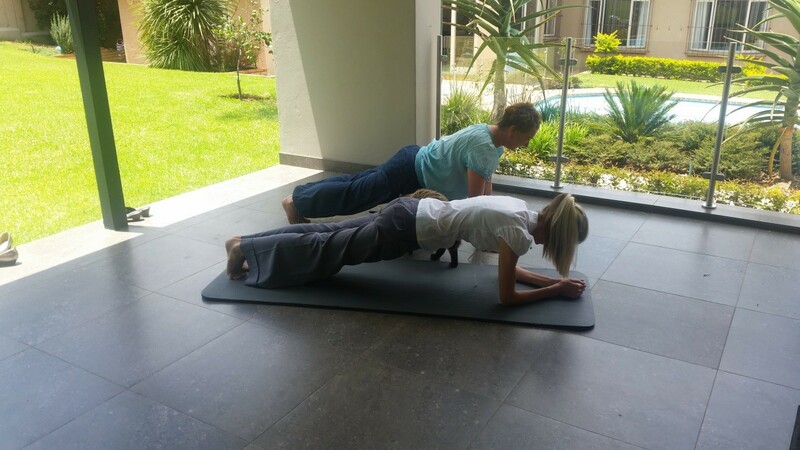 On the 9th of January I invited our practice members to join me in a Plank Challenge on our facebook page! This was inspired by the new year (as so many things are at the beginning of the year!) and a desire to do something together. The plank is a wonderful functional exercise that builds core strength. This in turn helps to improve our posture which is vital to the health of our nervous system. The nervous system is the controlling system of the body – every organ, tissue and cell relies on functioning signal from the nervous system to perform its tasks. Interference of nervous system signal – what we term a chiropractic subluxation – affects the optimum functioning of our bodies and thereby our general health and well-being. So good posture contributes to a healthy nervous system which means you are healthier! So back to the plank! I started the challenge in the full length position with my arms straight – this is quite a challenge! What was wonderful was the support and comments I received and I had to think about a few questions that were asked. Shouldn’t I be doing this on my elbows? Asked one of my friends. Yes – this is more difficult and I will do the challenge again in this position! I wanted to start where I was comfortable – with the hope of actually completing the challenge. But this does raise the point of being aware of body position while in the plank position. Your neck should be in a neutral position, keep the chin slightly tucked to extend the back of the neck to reduce strain. You should be able to place a rod along the spine and the back of your head, between your shoulders and your bum should all touch the rod. If you’re doing the plank on your elbows this line should be parallel to the floor. The legs should be straight, don’t bend the knees with the feet perpendicular to the ground the heels shouldn’t tilt in or out. Common mistakes include dropping the pelvis down, arching the back or sticking the bum in the air. Holding the stomach muscles by drawing the belly button towards the spine helps to prevent these from happening. My challenge to you is to join us – for 28 days do a plank, you don’t have to follow the times, do what your body can cope with. Enjoy the feeling of doing something consistently for a period of time. Post on the Facebook page and let us know how you’re doing. Blog posts are contributed by Dr Nicole Bernic and Dr Susan Goslett.